Each year, our schools participate in the MATHCOUNTS competition series. This is a national middle school math enrichment program offering competition and club activities designed to foster an appreciation of math among U.S. students to prepare them for future career opportunities and success. BASIS Independent Brooklyn won their regional championship! Max S. won 1st place, Finn C. won 2nd place, Zachary D. won 3rd place (tied with a student from another school), and Ronan M. won 5th place. In the state championship, BASIS Independent Brooklyn placed 19th out of 43 teams. Out of 197 individuals who competed, Max came in 33rd place, Finn C came in 58th, Ronan came in 96th, and Zachary came in 134th. This was the last year of competition for two the eighth graders, Max and Zach, and they finished with a bang! BASIS Independent Fremont won 2nd place Honorable Mention at their chapter competition. 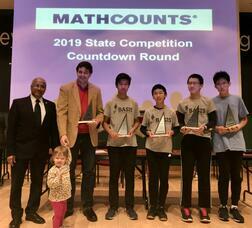 Allen F., grade 7, has moved forward to the state competition, and Christopher C., also grade 7, placed 3rd in the Countdown Round of the MATHCOUNTS competition. 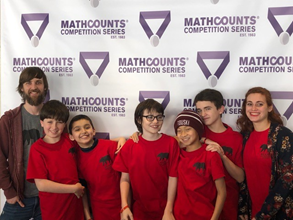 The BASIS Independent Manhattan MATHCOUNTS team of 7th graders Thomas P., Elliot W., Nikita C., and Sofia S. participated in the regional competition for their very first time! BASIS Independent McLean won both their regional AND state championship! They are officially three-time defending state champions. Ethan Z., Sam W., Max Y., Brian L., Alan H., Alexander O., and Raymond Z., placed in the top 25% of competitors in the regional competition. Students Neha R. and Eric F. also competed. Brian, Sam, Max, and Ethan went on to win the Virginia state championship. Both Sam and Ethan—who finished in first and second place, respectively, in the individual events—will compete in Nationals as part of the Virginia team. 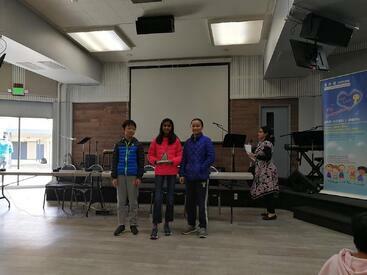 BASIS Independent Silicon Valley had four students take second place at the local chapter, or regional, competition. Jamin X., Catherine L., Henry Y., and Angela Q. each advanced to the state level. Our Middle School Math Circle Team won 3rd place in the Berkeley Mini Math Tournament (BmMT). This tournament is one of the largest national math competitions for middle school students. Through this competition, the organizers strive to encourage mathematical exploration and understanding by introducing concepts not covered in the typical pre-college curricula to students with high mathematical aptitude and interest. This year, BASIS Independent Silicon Valley formed several teams to participate the BmMT contest on November 18 at UC Berkeley. Through the individual, speed, puzzle, and team rounds, the BISV Jaguar team won the 3rd place overall team award. The five students in the team are Catherine L., David L., Jamin X., Kyle L., and Larry X. The Bay Area Math Olympiad is a four-hour marathon of mathematic proof writing. The BASIS Independent Silicon Valley Middle School Math Circle team placed 2nd in terms of both score and participation. Vishak S. and Indeveer M. received Honorable Mentions and Lucus W. received a Young Award for great performance for 5th grade. From our high school team, Adam T. earned an honorable mention. Founded in 1998, the Harvard-MIT Mathematics Tournament (HMMT) is one of the largest and most prestigious high school competitions in the world. Each tournament draws close to 1000 students from around the globe, including top scorers at national and international olympiads. HMMT is entirely student-organized by students at Harvard, MIT, and nearby schools, many of whom are HMMT alumni themselves. The BASIS Independent Silicon Valley High School Math Circle Team won 5th place in the HMMT. Congrats to Chet B., William P., Sanjana D., Siddharth S., Adam T., and Albert T! This year, BASIS Independent Manhattan was excited to give students in grades 2–5 the opportunity to take part in the Noetic Learning Math Contest (NLMC), a semiannual problem-solving contest for elementary and middle school students. Students participated in this national math contest by solving 20 math problems in 45 minutes. 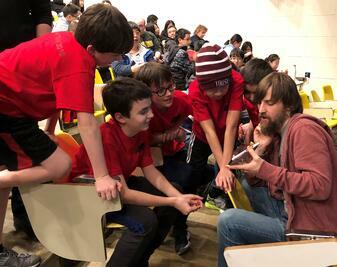 Their grade 5 students won a Team Achievement Award, meaning they were in the top 10% of all teams that participated, scored 5th overall, and took 2nd place out of all New York teams! Students in each participating grade also made the National Honor Roll while several others received Honorable Mentions. Competitions like these not only offer students the chance to explore their passions in math and other fields, but to build friendships with their peers and learn valuable teamwork skills. We love seeing our students challenge themselves and experiencing the rewards of their hard work! Congratulations to them all on these impressive accomplishments. Stay tuned for more updates across BASIS Independent Schools in the future.